Silk peptide is a kind of silk proteinic product with smaller molecular weight consisted by a few or ten odd amino acids. Its molecular weight is generally between 300 to 2000 with better water soluble property but not dissolved in the high density ethanol or ether. The silk peptide in large molecular weight has a good membranate character which gives the hair natural gloss and elasticity to let the hair easy dressing and making up. The silk peptide of low molecular weight is easy to be absorbed by skin, and to be permeated to the inner of hair to provide the necessary nurture for its normal metabolism, as well as to repair the injured hair. 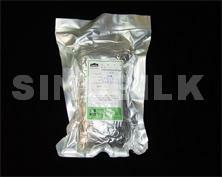 * samples containing silk peptide or silk powder. Note: The above mentioned data in table 3 & 4 are the united clinic testing results collected by Beijing Medical University, Beijing Friendship Hospital, the General Hospital of PLA & the other six Beijing universities & hospitals. (2) Controlling the growing of skin melanin. Melanin is the micro granular material which is produced by the tyrosine of skin melanocyte under the oxidation of tyrosinase. The experiment indicates that the silk peptide of molecular weight in 300-2000, which its density in 50%, 20% or 10% separately, the controlling rate for the grown melanin is 83.7%, 70.9% and 50.9% correspondently. The further testings indicate that comparing with the silk peptide in large molecular, the small molecular have the best results in controlling the growing of melanin. (3) Promoting the regeneralting of skin tissue & preventing the skin chap or the chemical injury. The silk peptide is more effective for promoting the wound-healing of skin. When cutting a wound at each side of a rabbit backbone & smearing the silk peptide or normal saline on it separately, the results indicate that the silk peptide is without any stimulation and can quicken the woundhealing. Therefore, the cosmetics of silk peptide has the better effects to prevent the skin chap, as well as to reduce the skin wrinkled or to prevent the skin being injured by dust, paint, acid, alkali or other chemical materials. (4)The excellent hair-protection function. The hair-protection function of silk peptide depends on the characters of absorptivity, adsorptivity, film formation & moisture-adjusting-keeping ability. Absorptivity & Adsorptivity: A series of experiments indicate that comparing with the other protein hydrolysate, (such as collagen, ossein and glutin etc), the obvious characteristic of silk peptide is easy to be absorbed by hair. The radiotracer technology also indicates that the absorption of silk peptide by skin or hair is mainly rely on its increased, the absorptivity of hair to the silk peptide is also increased. For the injured hair, its absorptivity & adsorptivity to the silk peptide in low molecular weight is above the average, as well as the function of hair-repairing & protecting from the silk peptide is more obvious accordingly. Film-Formation: The silk peptide of molecular weight in 1000-2000 have a good film formation character on hair because of its special gloss, as well as its good hand feeling and elasticity of hair. The X-ray diffraction method indicated that the film formed by silk peptide on hair is the groupβcrystal, which is not easy to be washed away by water. This is the important evidence of hair-protection by silk peptide. The experiment also demonstrated that a certain strength of the film on the hair can be used as the hair-forming agent, which can keep the hair fashion in good state for a little bit longer under 80% RH of moisture condition comparing with PVP, collagenous peptide and starch aqueous solution. Moisture-Adjusting & Keeping Function: Similar to skin, the healthy hair should keep a certain amount of water, otherwise it might be dry, forked or easy to be broken off and lost. The film formed by silk peptide on the hair surface can prevent the excess evaporation of moisture, and can regulate the humidity of the little space of hair surface as a natural moisture-adjusting factor, to let the hair soft and smooth. To sum up the above mentioned, the silk peptide have the functions of hair-nurturing, protecting and beautifying, which have superiority over common synthetic materials to its effectiveness and security. (5)The silk peptide have the best dissolvability with water, ethanol in 40% density, PVP, PVA & the systems of anionic, cationic, nonionic and amphoteric surfactants. After smearing the silk cream which containing the silk peptide on skin, following clinic testing results can be acquired (see table 3 & 4). Package: This product is packed in the aluminium-plastic compound bag in vacuum condition 200gr. It should be kept in cold, dry & no direct light place for two years' period of quality guarantee.